Pictured is The Honorable Judge Brock of the 8th District Court with CASA Advocates Kathy George, Abbie Kinkaid and Tammy Hodges. Court Appointed Special Advocates of Kay and Noble Counties are gearing up for spring trainings. CASA of Kay and Noble Counties provides trained volunteers to advocate for children who are victims of abuse and neglect. Trained advocates are appointed by the court system to provide recommendations to the judge in these cases, providing an independent look at the needs of the child or children. Abused and neglected children in Kay and Noble Counties need a voice in the court system, with almost 300 children who are under the courts’ jurisdiction due to abuse and neglect. Currently, there are 30 CASA Advocates serving in Kay and Noble Counties. 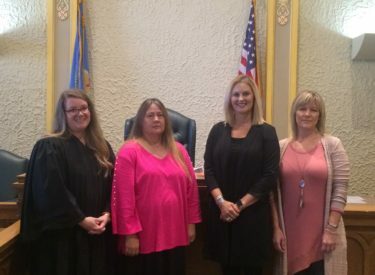 “The goal of Court Appointed Special Advocates of Kay and Noble Counties is to be able to provide a CASA Advocate for every abused and neglected child who is under the purview of the court. We are a long way from that goal, but hope that members of our local communities will step up and help fill this gap,” Sharon Mocabee-Sisco, Program Director of Kay and Noble Counties, said. Training classes are 30 hours in length and are done via on-line and in person classes and take place over the court of five weeks. Two classes are offered offered this spring, with the next class starting Feb. 25, followed by one beginning April 8.